Tonight we turn the dial to groove with our truest nature. We tune in to dance with the truths of our existence: that we are rhythmic beings interconnected in a cyclical society, abiding by seasons, revolving around a star in a galaxy spiralling into higher and higher frequencies floating in nothingness. We dance with our highest intentions of our heart-centered hue-man bodies to disrupt outdated systems and dissonant patternings within to attune to the collective song. 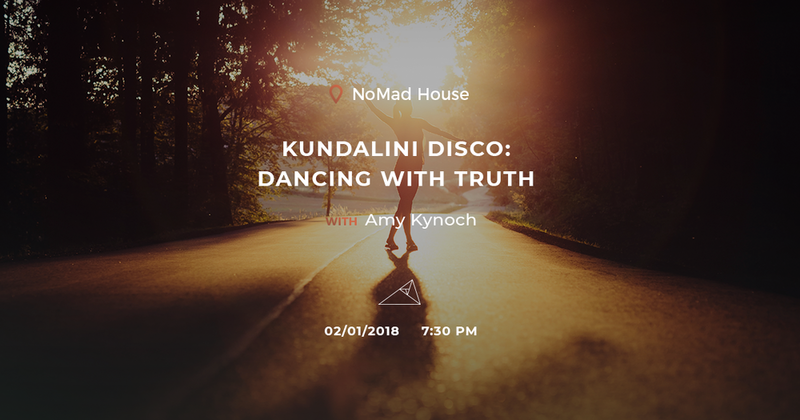 Kundalini Disco brings you a participatory, sensual and rhythmic experience of your breathe, body and the infinite. Guided by our highest intentions while applying the technology of Kundalini yoga & dynamic meditation, we create sacred space to transcend old embedded patterns to move and groOve with our higher Self. Combining rhythmic breathing techniques, mudras and meditations as taught by Yogi Bhajan we activate and liberate the primordial cosmic serpent energy, or shakti, through the body while moving to neo-sacred sound waves. As we awaken to our creative potentials, traveling by breathe to our higher frequencies we make our way to the dance floor of love to let it all go and let it all flow. Be ready to LIGHTen up; to surrender to your truest rhythms; to offer your high vibes to the community by way of sound, breathe, meditation and then ground it all with movement and complimentary elixirs.